Kenya’s Abel Kirui dominated the marathon on Sunday, taking the gold medal by the biggest margin of victory in the history of the World Championships. The 29-year-old triumphed in 2:07:38—an incredible effort considering temperatures ranging between 75 and 79 degrees Fahrenheit with up to 65 percent humidity. Abel Kirui was the only runner to go under 2:10 on the three-loop course through Daegu’s city center. 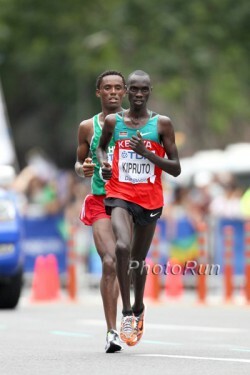 His fellow Kenyan Vincent Kipruto, finished 2:28 minutes behind him in 2:10:06. Feyisa Lelisa of Ethiopia placed third with a time of 2:10:32 hours. The Kenyan squad also won the team-scored Marathon World Cup by a large margin over Japan and Morocco. Surprisingly, Ethiopia, a traditional marathon powerhouse, did not make it to the podium. Only two of their five runners finished the race—and at least three participants must complete the 26.2-mile course for a team to register in the final standings. Following the top three across the line were Abderrahime Bouramdane of Morocco (2:10:55) and the Kenyan pair of David Barmasai Tumo (2:11:39) and Eliud Kiptanui (2:11:50). Eluid went off course in the early stages of the race when he ran on the wrong side of the road, which was separated by a barrier and had to double back for approximately 25 meters. Hiroyuki Horibata (2:11:52) of Japan came in seventh and was the fastest non-African finisher. Ruggero Pertile of Italy ran well for eighth in 2:11:57. The top American was Mike Morgan who collapsed from exhaustion on the road just a few feet short of the finish but summoned the courage to cross the line unassisted. He placed 31st in 2:18:30. 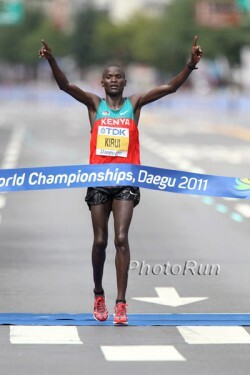 “It is a great moment for me, to know I have defended the title,” said Abel Kirui. “It was tough against strong competition but God gave me strength.” He became the third marathon runner to retain a title at the World Championships, following in the footsteps of Abel Anton of Spain, who won gold in 1997 and 1999, and Jaouad Gharib of Morocco, who repeated the feat in 2003 and 2005. At the Olympic Games, only two marathon runners have achieved consecutive gold medals: Abebe Bikila (Ethiopia) won in 1960 and 1964, while Waldemar Cierpinski of East Germany did so in 1976 and 1980. Looking ahead to the 2012 Olympic Games in London, it will not be easy for the Kenyan officials. They, like every other nation, are only allowed to select three athletes for the marathon and the depth of talent among their world-class runners will make choosing a team extremely difficult. “My victory today is a good sign for the Olympics,” said Abel—who, even after this World Championships victory can’t be sure that he will be on the Kenyan team next year. Indeed, to earn a place, he will probably have to win one of the classic spring races, like Boston or London, with a fast time. Incredibly, he was not even selected for the Kenyan World Championship team! He had a wild card place as the defending titleholder, but only made the team when other runners dropped out. Abel Kirui’s best time is 2:05:04 hours, which he set at the 2009 edition of the ABN AMRO Rotterdam Marathon to qualifiy him for the World Championship marathon in Berlin, where he also dominated the race to win in a championship record of 2:06:54. Since then, however, he has struggled. He was fifth in London in 2010 and then took ninth in New York. This year, he did not run a spring marathon, concentrating all his efforts on the Worlds—a decision that obviously paid off. The defending champion dictated the outcome of the marathon in Daegu. He forced the pace early on and ran his own race. A lead group of 16 went through halfway in 65:07 minutes with Abel Kirui at the front. The Kenyan’s fast pace broke up his pursuers early on. He then covered the distance from 25 to 30 kilometers in a blazing 14:18—a pace which would have been good enough to beat the Ethiopian Haile Gebrselassie’s world record of 2:03:59 by several minutes! At that point (a 30K split of 1:30:43 hours), he had an eleven-second margin over his competitors. Behind him, three runners were battling for the silver medal: Eliud Kiptanui, Feyisa Lilesa and Vincent Kipruto. Further back on their own were Abderrahme Bouramdane and David Barmasai Tumo. Abel Kirui looked stronger and stronger, covering the next 5K segment in 14:40. By this time, his lead had grown to over a minute and the excitement centered on the contest for second place between Vincent Kipruto and Feyisa Lilesa. It was only decided one kilometer from the finish when the Kenyan runner was able to push the pace. “I’m delighted that we have won gold and silver here,” said Vincent. “Our country should be proud of their success at these World Championships. I can run even better and hope to show that at the Olympics.” He has set his sights on a 2012 spring marathon to try to make the Kenyan Olympic team. 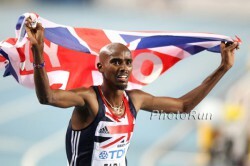 Britain’s Mo Farah is the newly-crowned champion of the men’s 5,000m. The long-distance ace succeeded in achieving what not so long ago many considered nearly impossible: defeating the strong African competition in the final of the World Championships. One year out from the Olympic Games in London, this was not only a triumph for him personally, but also for British and European distance running in general. From the track in Daegu, Mo Farah sent the message that Europe’s long distance runners can hold their own with Kenya’s and Ethiopia’s elite athletes. The last European runner to win a 5,000m title at World Championships or Olympic Games was Germany’s Dieter Baumann who secured Olympic gold in Barcelona in 1992. A good omen, perhaps, for 28-year-old Mo, who won in 13:23.36—just a week after taking silver in the 10,000 meters. American Bernard Lagat (13:23.64) and Ethiopian Dejen Gebremeskel (13:23.92) finished second and third respectively. Imane Merga of Ethiopia had originally placed third, but after receiving his medal, was later disqualified because he stepped onto the infield approximately 400m before the finish line. The beginning of the 5,000m event was slow, with the field going through the first kilometer in 2:50.9 minutes, while Mo Farah stayed in the back. He did not make a move until three laps to go when he surged to the front, alongside Ethiopian Abera Kuma. Mo, who is the reigning double European champion from Barcelona 2010 in the 5,000m and 10,000m, proceeded to dominate the pace and steadily increased the tempo. No one was able to pass him, yet the race remained hotly contested. Coming off the final bend, it looked as if Bernard Lagat might still take the lead, but the American could not get through the middle lanes and had to move out wide. 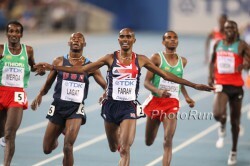 In contrast to the 10,000m final, Mo was able to counter the attack, falling to the track in joy after he crossed the line. “I learned from the 10,000m final and left a little strength in reserve for the finish,” he explained afterwards.